New regulations in the UK are changing the way companies report information regarding environmental and social aspects. Comply with the new and existing regulations using the CDSB reporting Framework. With the transposition of the EU Directive 2014/95/EU on the disclosure of non-financial and diversity information (NFR Directive), the UK regulatory landscape for non-financial reporting has taken a step forward towards greater transparency and accountability for corporations. The transposition comes as an amendment to the Companies Act 2006, through the Companies, Partnerships and Groups (Accounts and non-financial reporting) Regulations 2016. The UK government maintains a distinction between this regulation and the Companies Act 2006 (Strategic Report and Directors’ Report) Regulations 2013, which applies to a different group of companies. Here we provide an overview of the two current regulations and how companies can use the CDSB reporting framework. UK companies with over 500 employees have to comply with the Companies, Partnerships and Groups (Accounts and non-financial reporting) Regulations 2016. These include traded companies, banking companies, authorised insurance companies or companies carrying on insurance market activity. UK incorporated quoted companies (Companies Act 2006 definition) with less than 500 employees will continue to comply with the previous regulation, (2013 amendment). These include companies with equity shares listed on London Stock Exchange Main Market, EEA regulated, NYSE or NASDAQ. The information reported must refer to the company’s business model, the policies, outcomes, risks and KPIs related to those matters. Non-financial information must be included in the Strategic Report. If the company’s strategic report is a group strategic report, the non-financial information statement must be a consolidated statement (a “group non-financial information statement”) relating to the undertakings included in the consolidation. As a step forward in the roadmap to a resource-efficient Europe, as investors’ access to non-financial information will help reach the milestone of having in place by 2020 market and policy incentives that reward business investments in efficiency. Companies can use the CDSB Framework to comply with the new regulation. Scopes 1 and 2 only. The reporting requirements are only for direct emissions and indirect emissions from purchased electricity and gas. Emissions must be included in the Annual report to Directors or Strategic Report (see our guidance for details). To increase the number of companies reporting GHG emissions. Use the CDSB Framework to comply with the regulations, as referenced in Defra’s Environmental Reporting Guidelines (see Chapter 2). 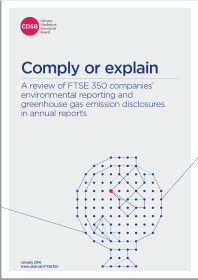 Comply or explain uses the experience of the FTSE350 with mandatory reporting to propose steps that could be taken by regulators to enhance the enabling environment for disclosure. This guide outlines the links between the new requirements of the UK Companies Act 2006 and a company’s existing voluntary CDP disclosure with the help of the CDSB Reporting Framework.